Sleep experts say we should get seven to nine hours each night, but as many as one third of Americans sleep for less than six hours regularly. Athletes, in particular, require sufficient sleep—not only to recover between matches, but to improve their overall performance, as well. Here’s how tennis players can start getting better sleep tonight. A good night’s rest starts with the mattress you sleep on each night, so if you’re not sleeping well, changing your mattress could make a world of difference. Most of us know that we should replace a mattress at least every 10 years, but how do you choose the right one? For starters, a mattress should provide firm but comfortable support to keep your spine in alignment while sleeping on your side or on your back. When you lie down, your mattress should give you a sense of floating, not sinking. Memory foam mattresses are a great choice because they conform to your body’s shape and eliminate pressure points. You should also choose a mattress that will help you sleep cool and provide the same feel no matter the ambient room temperature. Finally, be sure to pair your mattress with the correct pillow to keep your body aligned. Professional tennis players spend an inordinate amount of time on the road, traveling from tournament to tournament. While this lifestyle suits some, it also takes a toll on regular sleeping habits. One way to combat irregular sleep patterns is to take your home sleep routine on the road. While it’s not realistic to completely replicate your home environment when traveling, there are a number of small fixes that can make a big impact. To start, many tennis players will travel with their own pillow; not only for the comfort and consistency but the quality, too. Avoid wrestling with an uncomfortable hotel pillow the night before a big match—bring your own and get a better night’s rest. Another way to replicate your home sleep routine is to go to bed and wake up at your normal times. This will help balance sleep cycles and enhance the body’s natural repair processes for optimal health. Finally, sleep at the same temperature as you do at home. Sleeping too hot or too cold may interrupt your sleep, and studies have shown that disrupted sleep can impair memory, judgment and overall mental health, as well as damage your metabolism and undercut immunity. As an athlete, you’re all too familiar with the importance of what you put into your body. Outside of foods that fuel you, there are a variety of foods that can help support relaxation and better sleep. Tryptophan, the amino acid that’s abundant in turkey, can do more than put us into a mild food coma after Thanksgiving dinner. It also helps us relax and repair. Bananas and lentils are also good tryptophan sources and provide additional relaxing minerals like magnesium and potassium. Carbohydrates, in moderation, can also help tennis players sleep. Don’t eat too much before bed, however, as the extra digestive efforts can negatively affect sleep quality. L-theanine enables the body to produce other calming amino acids, such as dopamine, GABA and Tryptophan and helps support concentration, focus, deep muscle relaxation and improved quality sleep. Abhwagandha contains active constituents called glycowithanolides, which mimic certain corticosteroids, supporting healthy cortisol levels and the circadian rhythm. Melatonin supports sleep onset, quality of sleep, increased REM time, deep sleep and dreaming—all factors that lead to better quality sleep and produce greater mental, physical and emotional rejuvenation. Melatonin can decrease the amount of time required to fall asleep, increase the number of sleeping hours and support daytime alertness. I recommend taking just 5 mg of melatonin as taking too much can impair the body’s natural production of it and may cause us to become dependent on the artificial form. At bedtime, your electronic devices can lead to unwanted alertness due to changes in your eyes and brain, as well as the suppression of melatonin by the bright light emanating from screens. These physical reactions ultimately lead to sleeplessness. As a rule of thumb for getting better sleep, turn off your electronic devices at least 30 minutes prior to heading to bed. Rather than scrolling through social media or camping out with Netflix, do something that doesn’t involve exposure to a screen, like meditating or reading your favorite tennis magazine. If making changes to your sleeping habits sounds daunting, start small. Choose one action to incorporate into your routine tonight, and then make gradual changes as the nights continue. 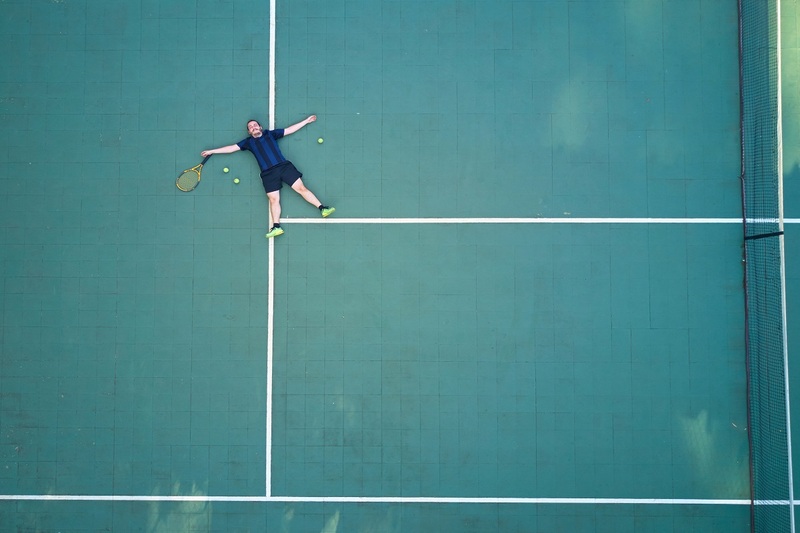 You’ll be sleeping soundly—and noticing the difference a good night’s rest has on your tennis game—in no time.